Provide comfort for the family of Anthony Blasioli with a meaningful gesture of sympathy. 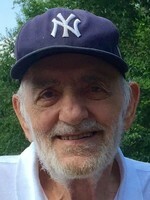 Anthony John Blasioli Sr., 88 of Pittsfield, MA passed away on March 28, 2019 at Berkshire Medical Center. He was born in Pittsfield on May 1, 1930 a son of the late Domenico and Mamie (DeSanctis) Blasioli. He attended Pittsfield schools and graduated from Pittsfield High School in 1948 and also graduated from Berkshire Community College. Anthony was a veteran, serving in the U.S. Navy and Air Force and was employed as a Mold Maker for 70 years. Survivors include his wife, Janet I. Blasioli, having just celebrated 70 years of marriage; three daughters, Paula (Art) Lemire, Susan (William) Harrington, Candace (Joel) Scussel; one son, Anthony Blasioli Jr., son-in-law, Bruce Stringer; nine grandchildren, Heidi, Erik, William Jr., Andrea, Jacob, Hanna, Cassondra, Jessica, Jill and 12 great-grandchildren. He was predeceased by his daughter, Linda Stringer and siblings, Dorino, Aldo, Joseph, Dominick and Sr. Lucia. The best part of any day was when we spent it with Tony. We were all so LUCKY to have such a wonderful man in our lives. He was so kind and gentle, with a sweet smile. Just a nice man that everyone loved. He would do anything for anyone. Funeral Notice: A Liturgy of Christian Burial will be celebrated Tuesday, April 2, 2019 at 9:30 A.M. at St. Joseph's Church, 414 North St., Pittsfield with the Rev. Monsignor Michael A. Shershanovich, Pastor of St. Joseph's church officiating. Burial will follow in St. Joseph's Cemetery. THERE ARE NO CALLING HOURS. In lieu of flowers, memorial donations are suggested for Shriner's Hospital for Children in care of the FLYNN & DAGNOLI-BENCIVENGA FUNERAL HOME, 5 Elm St., Pittsfield, MA 01201 who is in charge of arrangements. To add to the Book of Memories, please visit www.flynndagnolifuneralhomes.com. To send flowers in memory of Anthony J. Blasioli Sr., please visit our Heartfelt Sympathies Store. Provide comfort for the family of Anthony J. Blasioli Sr. by sending flowers.